FBEG, BioCentrum- DTU, Technical University of Denmark, DK-2800 Kgs. Lyngby, Denmark. 2 Department of Plant Biology, Royal Veterinary and Agricultural University, 40 Thorvaldsensvej , DK-1871 Frb.C, Denmark. 3 Danisco Cultor, 38 Edwin Rahrs Vej, DK-8220 Brabrand, Denmark. 4 KMC, Herningvej 60, DK-7330 Brande, Denmark. 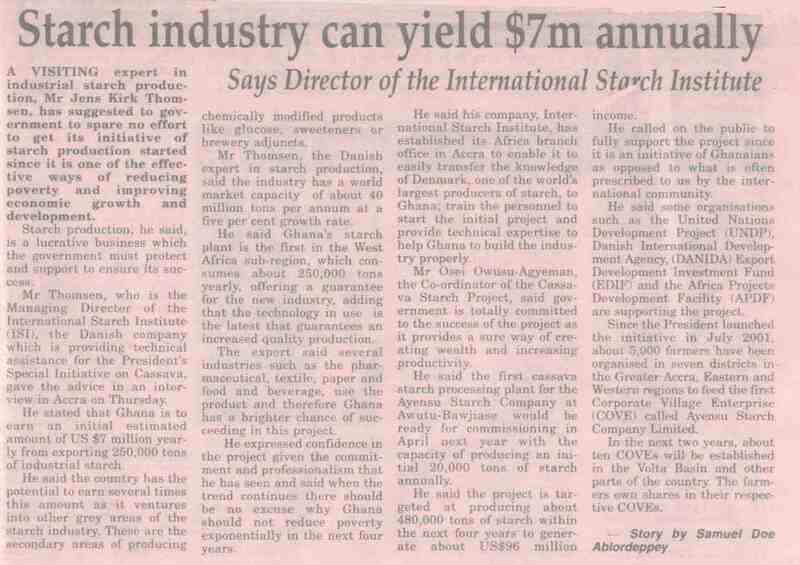 5 International Starch Institute, Science Park, DK-8000 Aarhus, Denmark. The work in our laboratory is concentrated on the study of starch structure and functional properties with the aim of being able to understand their correlation. This has led to several subprojects in which we both develop and optimise a pilot plant process line for isolation of starches and characterise the functionality of isolated native and modified starches in water based systems and food models. The following are examples of the ongoing studies. Starch based food models are developed to enable a functionality screening of in planta modified new starches. These models include a white sauce, a salad dressing and dutch vla. Functional properties of starches that are modified by specific in planta alteration of the amylopectin branching are analysed. These analyses involve e.g. small deformation testing of gels on a controlled stress rheometer (stress tech) and gelatinisation and crystallinisation analysis by differential scanning calorimety (DSC). Melting properties of Lintner dextrins derived from size fractionated native potato starches containing different amounts of covalently bound phosphate are studied by DSC. The history of isolated starches has an influence on their function properties. The use of different isolation procedures and also scaling up the procedure may influence the properties of the starch. A potato starch ringtest has been performed in which the starch from one potato batch is isolated in a series of different scales from laboratory - to industrial scale.